At around 10:30 this morning, keeper staff observed mating behavior between Lana and Nazca! This was very unexpected because Lana was thought to be too young to reproduce. She is only about 23 months old. 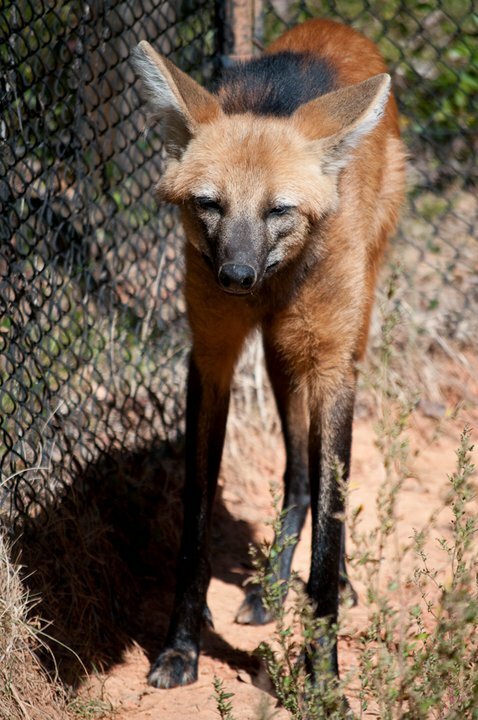 Most maned wolf females don't start to reproduce until they are about to turn 3 years old. Maned wolves are monoestrous, meaning that they can only breed once per year. Their breeding season in this part of the world is between October and February with estrus lasting up to ten days. Thinking that we were just getting baseline data and practicing for next season, keeper staff began taking daily behavioral observations in October 2010. These observations were recorded in the form of an ethogram which is a chart that allows you to quantify sets of pre-described behaviors. Because of the observations, we were able to determine that today was, in fact, the first full day of the estrous period. By knowing the length of the estrous period and keeping track of which days the wolves engaged in the most reproductive activity, we can better estimate the date of possible conception, which will help us to keep track of the possible gestation period.